Is it time for programme 2.0? 1 Comment on Is it time for programme 2.0? THERE was a time when I would feel like something was missing if I didn’t get a match programme when I went to a game. It was part of the matchday experience. I rarely feel like that today and that’s because I don’t need a programme anymore. A teamsheet, yes, but no more than that unless I need to get a flavour of the club that I haven’t already picked up from their website or social media. Like many youngsters, I collected programmes, in fact I still have every Chelsea programme from 1946-47 to 1987-88. They’re gathering dust and sooner or later, Mr eBay will be selling them on my behalf, I am sure, for like all collectibles, they take up vast amounts of room. Football news is in demand like never before. All supporters want to read about their favourite team and gorge on information. Whether it’s Real Madrid to Rhyl, Milan to Montrose, fans are desperate to know what’s happening. Football saturates to such an extent that we may not need programmes anymore. Many non-league clubs are up against it when it comes to funding a programme and actually getting someone to produce it. There’s little motivation in working 10-12 hours a week on a product that only 30% of your crowd is bothering to buy. 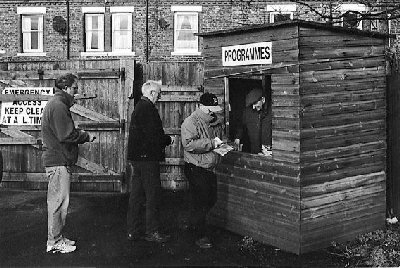 “I just look at the website, it doesn’t cost anything,” is a comment you often hear when a fan is asked if they buy a programme. I spent 13 years writing a programme, the first few years were good fun, I won some awards, people liked it and sales were good. But towards the end of my run, the fact that sales had dropped so much and people didn’t feel the need to buy one (we also had a good website) was quite dispiriting. After years of producing the programme, the sense of liberation I felt at finally packing up was incredible. It had moved from a labour of love to an anvil of resentment! The problem is, the leagues demand that you produce a programme of a certain size (otherwise you risk a fine) so clubs have to deliver a product they know will not make money, and at best, will break even. Often, in the case of replays and hastily-rearranged games, there’s not enough time to produce something so you work through the night to ensure the club does not lose face. The time may have come to make life easier for non-league clubs that are, essentially, part-time on the field, but increasingly, full-time off the pitch. Add-up the time spent by the dozen or so people that most clubs rely on and it will probably equate to two to three people working full-time. It’s not easy and if the demands continue, it basically means that non-league will continue to be the domain of retired or semi-retired men (i.e. people with time on their hands). So what’s the answer? Get innovative. Consider scrapping the programme, introduce the team-sheet concept and leverage the power of the internet when it comes to advertising revenue. Some clubs have been slow in utilising the internet for advertising purposes – the website will always come out on top if you analyse the stats. If a 300 crowd yields 60 programme sales, the total exposure for the season, at best, is 1,800 people. An advert on the web can be seen by 20,000 people a week, and that’s conservative. No contest – you just have to persuade local businesses, many of whom are not of the “internet age”, that the web is the way ahead. Younger folk, who are of the “virtual world” rather than the “physical world” (and this applies to things like music, books, films etc), probably have little desire to buy and own a paper programme. One way of exploiting the internet is to introduce apps that supporters can tap into on their smart phones. The really tech-savvy clubs could time the launch of information so fans can access the line-ups, scores and team news before the kick-off. As it happens, twitter and similar forms of media are already carrying team line-ups in a more digestible form than many non-league tannoys. This is all very progressive and absolutely au courant, but non-league demographics will still demand that good old fashioned print media is still on offer. What is pleasing is that posters have made a comeback in recent years – just look at the magnificent and highly humorous offerings from Lewes. And there are a lot of, let’s say our more senior non-league colleagues, who are not users of computers, let alone social media. Why not consider this quirky concept – the sandwich board. A willing horse (not literally) could be led around the pitch with a board displaying the teams – better still, make it a giant tablet device! It could become a pre-match and half-time ritual! A sort of human App, if you like!